I Won Hyatt Globalist - Now What? I Won Hyatt Globalist – Now What? I consider myself to be generally lucky. Sometimes, I am not that surprised at my luck. Other times, that luck genuinely surprises me. 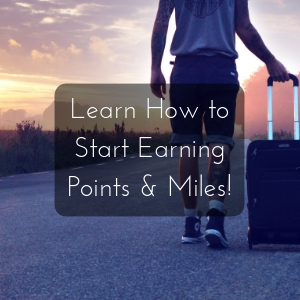 Recently several other points & miles bloggers held a giveaway where the prize was a year of World of Hyatt Globalist status. One of those bloggers was Kathy, from Will Run for Miles – a travel fitness and running blog . I typically don’t enter giveaways since I don’t have much luck winning. She and I have interacted quite a bit so I decided to enter her giveaway albeit with fairly low expectations. I got a message from her several days later telling me to check out her latest blog post. Lo and behold, I won! What is World of Hyatt Globalist? Earlier this year, Hyatt completely rebranded and “enhanced” (read about why I put quotes around that here) their loyalty program. What was known as Gold Passport is now called World of Hyatt. Also, Gold Passport had just 3 status tiers (Gold, Platinum, and Diamond). Now World of Hyatt has 4 tiers: Member, Discoverist, Explorist, and Globalist. I’m not sure who (or what) came up with those names, but it’s what we’ve got. Before the change, there was a pretty stark difference with the benefits of the bottom two Gold Passport status tiers compared to the top tier. The Platinum benefits were much weaker as a mid-tier status; whereas Diamond got much better benefits which included breakfast and confirmed suite upgrade awards. Achieving Diamond status was also relatively easy since it only required 25 stays or 50 nights in a calendar year. With the new World of Hyatt statuses, they are much more incremental with the benefits of each tier. Hyatt made Globalist (top tier status) much harder to achieve without a big increase in benefits – at least in my opinion. Regency Club® or Grand Club® lounge access, including breakfast Enjoy daily complimentary full breakfast in hotels without a club lounge. Enjoy daily complimentary full breakfast in hotels without a club lounge for up to two adults and two children. There are, of course, other benefits, but those are the most important benefits. The waived resort & parking fees are nice. Resort fees can be over $40 per day! It would have been nice to get free parking on all stays, not just award stays. I’ll admit that I’m being a bit facetious asking that, but I really didn’t think I’d win. My Hyatt stays are usually just my annual free night I get from my Hyatt Visa card, and maybe one or two other nights using points. Aside from the blanket “stay at more Hyatt hotels this year”, this is definitely making me look at visiting places where I can stay in a Hyatt. The paid-time-off I get from my day job is limited so my trips are usually 1-2 night weekend jaunts. It has taught me to make the most of my weekends away. On the other hand, it most likely means that a longer intercontinental trip is not likely to happen this year. Honestly, I haven’t made a lot of travel plans for the rest of the year. One reason is that life has been super busy for me this year. Another reason is that I was somewhat indecisive on where to go for weekend trips. 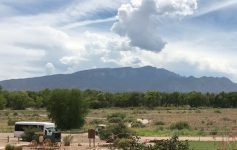 Winning the status has reinvigorated me to look at places to visit with Hyatt hotels that are some how unique. Opened in November 2016, this may be the newest Andaz in the chain. 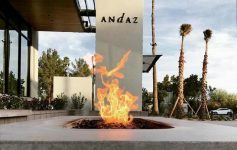 Andaz hotels are typically very unique and take style elements from the local area – past and present. The Scottsdale location does so by modeling the guest rooms after the pueblos of the Native Americans. How cool! 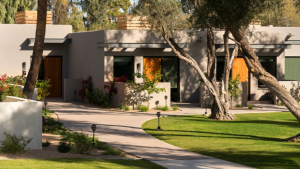 Click here for the latest rates for Andaz Scottsdale! 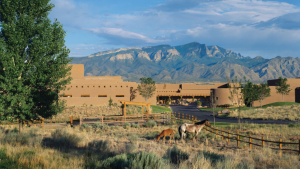 The Hyatt Regency Tamaya Resort is located about 20 miles north of Albuquerque, New Mexico, in the foothills of the Sandia Mountains. The scenery surrounding the resort looks amazing. Aside from the beautiful scenery, the resort also has an on-site horse rehabilitation center which is a very unique feature of any resort. Trail rides are offered for $75. I’m not sure what is included in it. That seems a bit steep, in my opinion, so I may not partake in it. 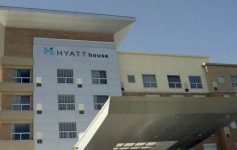 Are there any Hyatt hotels that are interesting to stay at within North America that I didn’t mention? Let me know and I’ll be sure to take a look if I can fit it in with my travel schedule. Congrats on winning Globalist! Enjoy the perks. Can’t wait to see what cool upgrades you receive! Thank you, Lee! I’m definitely looking forward to seeing what I upgrades I get. So far no upgrade, but a delicious fruit tart plate (with a bit of gold leaf!) was waiting for me.